Artists Share Lessons From Loss - The Hospice Insider is the Place To Land for Hospice News, Information, Resources and HospiceFact. Celebrate all stages of Life. Nielsen Chapman, Newton-John and Sky hope their new album “LIV ON” will help people heal. Beth Nielsen Chapman learned an important lesson about life, death and what the human spirit can accomplish when her late husband Ernest was diagnosed with cancer 20 years ago. Ernest’s doctors told him he had only six weeks to live when they delivered the news, she said. But he defied this prognosis and lived on for another 18 months before he passed in 1994. 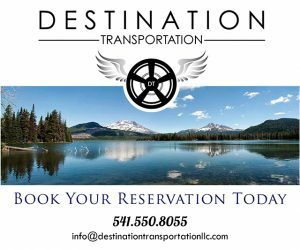 “There’s just so much energy you can get if you are really determined,” said Nielsen Chapman, a two-time Grammy nominated country singer/songwriter. Nielsen Chapman said Ernest’s story was the inspiration behind her 1997 hit “Sand and Water,” a song Elton John performed at his concerts in the wake of Princess Diana’s death. This song also appears on a new album called “LIV ON” that she is producing with Olivia Newton-John and Amy Sky. Released digitally Oct. 7, the “LIV ON” album contains 11 songs the artists wrote about times they experienced loss and how they lived through it. They hope sharing these experiences will help others who are suffering through tragedy and grief. Sky learned one of her biggest lessons from loss when she gave birth to her daughter Zoe and found out her father had Parkinson’s disease in 1990. She saw a number of similarities between a parent caring for a newborn child and a child caring for an aging parent that shined a light on the cyclical nature of life. “I had just returned the love (my parents) had given me,” said Sky, who drew heavily from this experience when she wrote “I Will Take Care of You” in 1996. A new version of this song, which Sky has updated to reflect the sudden loss her mother in 2011, also appears on the “LIV ON” album. Sky’s experience caring for her father, who died seven years after his diagnosis, also left her with a lot of mixed emotions because it seemed like she was on a never-ending quest for his approval throughout their relationship. Nielsen Chapman has also kept the lessons she learned from Ernest’s battle with cancer close to her heart. They’ve helped her continue through a number of struggles, she said, the least of which was her own battle with breast cancer 16 years ago. Nielsen Chapman’s struggle with breast cancer and her subsequent advocacy for cancer survivors and prevention united her with Newton-John, who was diagnosed with breast cancer in 1992 and has made a cancer treatment and wellness center in Australia one of her personal causes. Newton-John’s battle with breast cancer brought her and Sky together as well. While they’ve known each other since the late 1980s, Sky said she and the four-time Grammy winner formed a tight bond when they wrote the songs for “Grace and Gratitude,” a 2006 album designed to help cancer charities. Sky said she knew this album – which lends its title song to “LIV ON” — would not be the last time she and Newton-John would come together to help people heal. And it seems the pair found the perfect partner for their second time out when they asked Nielsen Chapman to join them in mid-2014. “We all felt compelled,” said Nielsen Chapman, who hopes the songs she, Newton-John and Sky wrote for “LIV ON” will help people through the challenges of life as well as the challenges of death. 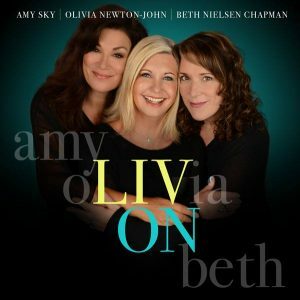 The three artists behind “LIV ON” have spent the past few weeks doing a series of radio, television and print interviews to prepare for the album’s digital release and the Oct. 14 release of its compact disc. But their work does not stop there. 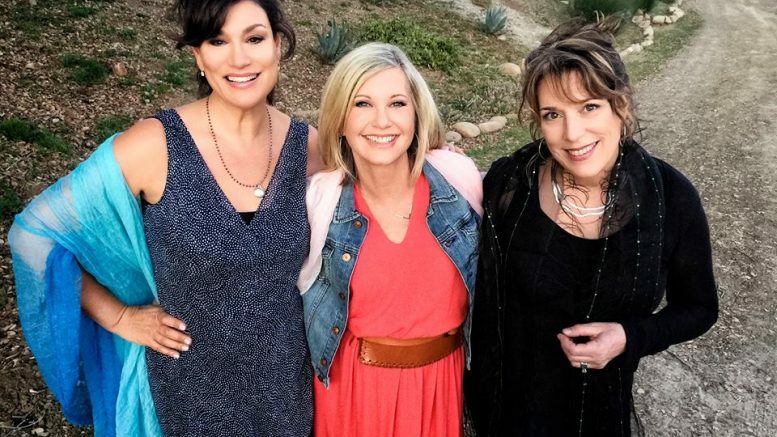 That’s because the three artists plan to follow “LIV ON’s” release with a series of concerts where they’ll perform its songs and ask others to share their experiences with grief and loss, said Dianne Gray, president of Hospice and Healthcare Communications.